The Chandigarh Administration today cancelled the bar licence of the Chandigarh Club, a leading social club of city for period of three days and also imposed a fine of Rs 50,000 on the Club. 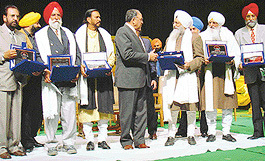 This year’s annual award ceremony of Punjab Sangeet Natak Akademi was different from earlier ones in more ways than one. Good Samaritans wanting to help accident victims lying on the road will not face uncomfortable questions from the cops. If an accident victim has been brought to the hospital for treatment, he or she will not be questioned by the police. UT Administrator S.F. Rodrigues today gave officials 15 days to come up with a workable traffic plan for proper implementation, with little inconvenience to public. The Post Graduate Institute (PGI) here, in a press statement, has said that all heads of the departments of the PGI were empowered to recommend a patient “poor-free” in case he\she does not carry a yellow card. Chandigarh's loss has been Zirakpur's gain in terms of the land prices which have shot up meteorically in the last one year, courtesy the unprecedented hike of property prices in the city beautiful. The alleged killer of Muskan, Dildar, had decided to put off the murder plan when the call girl suddenly pushed him on the ground in the bathroom of the hotel. Colonel Anil Sahgal, accused in the Tehelka case today admitted before a military court that he had divulged certain technical information pertaining to procurement of Hand Held Thermal Imagers (HHTI) to operatives of tehelka.com who were posing as arms dealers. Back after attending the 19th World Congress of International Society for digestive surgery at Yokohoma, Japan, the two delegates of the six-member Indian contingent say that the information gathered at the Japanese functioning has lessons in store for India. The Punjab and Haryana High Court today issued notices to the Chief Secretaries of Punjab and Haryana as also the Adviser, Chandigarh Administration, in a contempt petition moved by Mohali-based Citizen Welfare Federation. 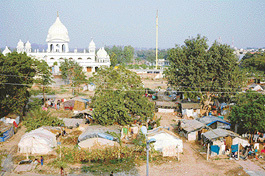 Repeated attempts by the enforcement staff of the Chandigarh Administration to clear encroachments from the government land in different parts of the city have come a cropper with the encroachers staging a comeback. Maneesha, a class nine student of a city school, was a topper throughout when all of a sudden she began scoring low marks. Her parents started exerting pressure on her to perform better. In no time teachers, too, went on a ‘scolding spree’. The Quarter Centurions, an air Defence Regiment celebrated its 45th Raising Day some where in the Western Sector today. A number of functions, including a sainik sammelan, officers mess functions and a barakhana marked the occasion. Mr Lalit Sharma, Adviser to UT Administrator, today exhorted the UT police to act like a guardian of civil rights. A section of the Ratwara Sahib Gurdwara management today came out in support of the Mullanpur SHO, who has been transferred to the police lines, Ropar, by the SSP, Ropar. The Chandigarh chapter of Aeronautical Society of India (AeSI) has been awarded the Best Branch Trophy for the year 2003-04. The award was received by the branch's secretary, Wg Cdr H C Choudhry from the AeSI president, Air Chief Marshal S K Krishnaswamy during its annual general body meeting at Pune on December 12. Members of the Semi Conductors Limited (SCL) employees union here today objected to the pending conversion of the company into a society by the Government of India. The union president, Mr Amrao Singh, said though they did not have any written proof of the said move, the employees had got this information from the management. It has been decided by the Department of Information Technology, Chandigarh Administration to carry out a special drive for the senior citizens card, disabled persons card and registration of tenants and servants at the sampark centres located at Sector 43, Sector 18 and Manimajra. The Pensioners’ Day will be celebrated by the Coordination Committee of Central Government Pensioners’ Association (CCCGPA), Chandigarh region on December 17. According to Mr Rajpal Sharma, Secretary General of the CCCPGA, the above day will be celebrated in the auditorium of Government Museum and Art Gallery, Sector 10 from 10 am to 1 pm. As a part of the 150th birth anniversary celebrations of Ma Sharda, the Ramakrishna Mission organised a devotional music soiree at the mission auditorium on Wednesday. The Kharar police seized 15 gm of smack from a Kharar’s resident. 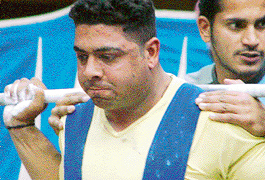 The operation was carried out by police station in charge Bhagwant Singh and nabbed Ranbir Singh alias Rana for possessing smack. A case under the NDPS Act has been registered. Certain residents of Phase VII here today felled five healthy trees near house numbers 363 and 364. The trees were fully grown and planted on PUDA’s land in Phase VII. Naib Tehsildar, Mohali, Sucha Singh has been booked by the police for allegedly cheating an 86-year-old man of Chilla Manouli village, Pritam Singh. A house was reportedly burgled in Mani Majra while a truck and a scooter were reportedly stolen from the city, the police said here. Second “Apni mandi” shall be held on every Tuesday commencing from December 21 in Sector 39. This will be in addition to the apni mandi on Saturday. 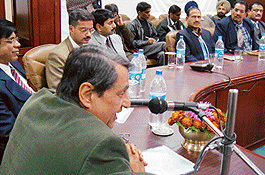 Defending the commencement of the Masters in Fine Arts course at the Government College of Arts, Sector 10, the UT Administration has decided to approach the All-India Council of Technical Education for approval despite objections raised by the latter in a show-cause notice issued recently to the college. The indefinite fast by students of the Law Department, Panjab University, seeking condonation of lectures, entered the eighth day, here today. Two more students, Sunit Malhotra and Pritpal Singh Sangha, on fast were shifted to the hospital on account of health condition. Alumni and students of Punjab Engineering College, Sector 12, and Government Medical College and Hospital, Sector 32, are organising "Mock 2005" based on CBSE's All India Engineering Entrance Examination and All India Pre-Medical Test 2005 on March 27. 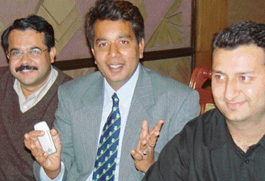 To celebrate its 25th anniversary, Sjoba would organise a winter fest. The fest will begin with the performance by the famous Indian Rock group ‘Euphoria’. Headed by the talented Dr Palash Sen the band promises to set the mood for the winter ball. 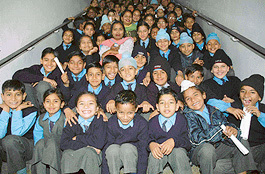 Carol singing groups from eight schools of Chandigarh converged on Mount Carmel School in Sector 47 here on Tuesday for a concert of Christmas carols. 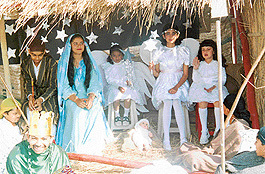 A tableau depicting the Nativity scene put up at Mount Carmel School, Chandigarh, for the Christmas Carol Concert on Tuesday. Cinematographer Manmohan Singh has added many a new dimension to the medium of cinema. Earlier as a photographer he captured majestic “silver screen” moments in “Chandni” and “Darr”. Magic show and ragini singing, besides Indian classical and folk dances were organised at a cultural and sports bonanza held this evening. it was organised by a coaching centre. Four more cases of leprosy have been detected in the city slums during the skin and detection camps held at Colony No 5 and Burail village by the District Leprosy Society under the UT Health Department. A workshop on medicine information was inaugurated at the National Institute of Pharmaceutical Education and Research (NIPER) here today. 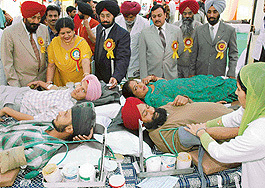 As many as 254 persons, including 40 couples donated blood at the 34th blood camp organised by the Baba Shiekh Farid Blood Donors Council in collaboration with the New Life Blood Donors and the Social Welfare Society, Punjab. 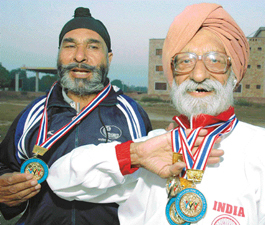 At 85 plus, Mohali-based Pritam Singh Kochhar is on top of the world after securing four gold medals in various events in the just concluded 13th Asian Masters Athletics meet at Bangkok (Thailand) in the first week of December. Sandeep Duggal and Parveen Duggal made it to the last four in snooker in senior section in the 20th Chandigarh UT Chaudhary Vishnu Pal Singh Memorial Snooker and Billiards Tournament played here at Sector 22. The Hutch Inter-Media Cricket Tournament will begin at the grounds of DAV Senior Secondary School, Sector 8, here tomorrow. 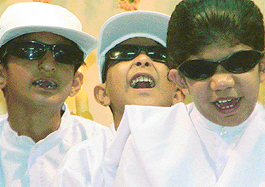 A two-day sports meet for the visually challenged will be organised here on January 22 next year. More than 15 teams from across the region are expected to participate in the field and track events followed by cricket matches.